BBC Middle East editor Jeremy Bowen has revealed he has been diagnosed with bowel cancer. 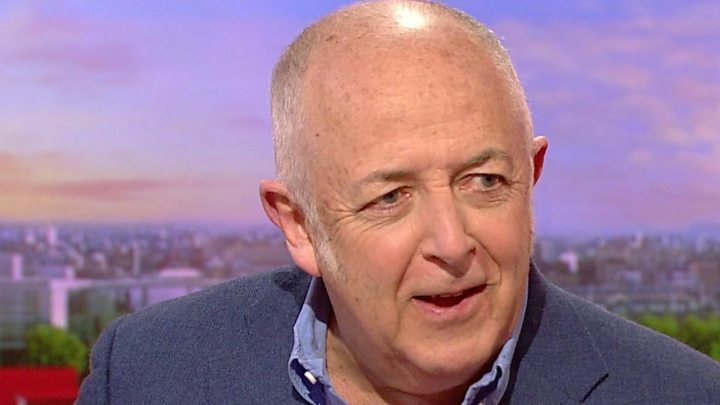 The former BBC Breakfast host said he was undergoing chemotherapy after noticing "funny pains in my legs and in my back" whilst in Iraq last May. April is bowel cancer awareness month and Bowen shared his diagnosis to encourage others to get tested. Bowel cancer screening in England and Wales is to start earlier, at age 50, bringing them in line with Scotland. Doctors initially believed the veteran journalist's pain was due to scarring from previous surgery, he told BBC Breakfast, the show which he presented alongside Sophie Raworth between 2000 and 2002. "I had no symptoms - none of the classic bowel cancer symptoms. Nothing at all. But I thought I should get a test," the 59-year-old said. Bowen said he received a positive result and had a colonoscopy - a camera inserted into his colon to look for signs of cancer. "It [the colonoscopy] is not nearly as bad as it sounds - they give you lots of drugs," he said. Surgeons found a tumour, which they removed, and he started chemotherapy, he said. Bowen, born in Cardiff, and a BBC journalist for 35 years, said his diagnosis "could have been earlier, but had it been later it would have been much more serious". Bowel cancer is the fourth most common cancer in the UK, with 42,000 people diagnosed every year. More than 16,000 people die from the disease in the country annually, according to Bowel Cancer UK. In England, Wales and Northern Ireland, people between the ages of 60 and 75 are invited to be screened for bowel cancer every two years. In Scotland, screening starts at age 50. Following recommendations from experts, NHS England and NHS Wales last year said they would start screening at the earlier age of 50. But, according to Bowel Cancer UK, a firm date for the change has not yet been set. The chief executive of the charity, Deborah Alsina, told BBC Breakfast that Bowen would have been tested at least three times by the time he was diagnosed, if the standard screening age had been 50. Bowen said: "The key thing is - get tested. I've been saying to all my friends - get tested. "Things to do with your bowels and poo ... are not things people normally want to talk about. But actually it's part of all our lives and you need to work on it." He said a gastroenterologist had told him: "Don't die of embarrassment, for God's sake." Bowen said the chemotherapy "is not nearly as bad as I thought it would be in terms of side effects, but it affects people differently and I think I've just been quite lucky to tolerate it better than I expected". "You've got to keep positive about things in life. It's all part of the journey, as they say on Strictly [Come Dancing]," he added.